I've had an iPhone since the 3G came out in 2007. I've worn a case on said phone(s) for approximately 2 weeks, so you will understand when I tell you that I'm not a case-fan when it comes to covering up my beautiful glass and aluminum devices. That being said, however, I can really appreciate a case that actually serves a larger purpose; truly protecting your phone from any and all of the elements. Enter the Seido OBEX Waterproof case for iPhone. With an upcoming trip to Disneyland with my family, I always fear getting my phone wet on rides such as Splash Mountain or the like, so I actually had a chance to try out the OBEX case for the last 7 days and it stood up to grueling 12+ hour days, falling a few times, and even getting wet on some rides...and I was resting easy during the whole ordeal. Now, I wasn't immediately convinced to be honest. 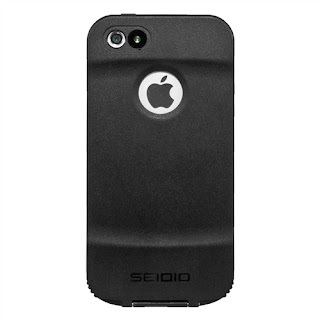 Having been my first case that was meant for protecting my device from not only water, but dust, shock, etc, I was a little taken aback by the seemingly "plastic-y" feel of the case. I worried that it may not really hold up to the task. Of course, I sealed it all up without my phone in first, and submerged it in water, (as suggested in the packaging) holding it under water with some weight to keep it from floating. I left it in the pool for a few hours, and it came out without a trace of moisture in the internals...a good sign. Now for the real test...I placed my iPhone 5 in, very carefully, (it's a very tight fit, which suppose makes a lot of sense). There are little rubber stoppers for the mute switch, as well as the bottom of the phone where the lightning port and the headphone jack are located. I did have to adjust the red rubber strip and make sure the phone and case were properly sealed...but once I did, it looked nice, and the "cheap feel" worry I had before was gone. Here was a case that added very little in terms of bulk to the thin svelte iPhone 5 design, and not a lot of weight either. I could get behind that. I used it for a full week, and found it to truly fulfill all of it's promises, and though, I suppose, I don't live in an area of the country susceptible to much snow, (Phoenix, AZ) I imagine it would do just fine. Included are a few extra rubber silicone stoppers in case you lose them, as well as an old-school belt clip that if you wear, you must be working in the field someplace, otherwise, you lose all credibility (I kid, but kinda not). Mashbuttons would definitely recommend this case if you are prone to dropping your phone, or want to protect it from the elements.